Ali Abdullah Saleh (Arabic: علي عبدالله صالح (help·info), ʿAlī ʿAbdullāh Ṣāliḥ; 21 March 1947[note 1] – 4 December 2017) was a Yemeni politician who served as the first President of Yemen, from Yemeni unification on 22 May 1990 to his resignation on 25 February 2012, following the Yemeni Revolution. Previously, he had served as President of the Yemen Arab Republic, or North Yemen, from July 1978 to 22 May 1990, after the assassination of President Ahmad al-Ghashmi. **Abdrabbuh Mansur Hadi served as Acting President from 4 June 2011 – 23 September 2011 and again from 23 November 2011 – 25 February 2012. 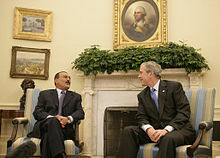 Saleh developed deeper ties with Western powers, especially the United States, in the War on Terror. Terrorism may have been used and encouraged by Ali Abdullah Saleh to win Western support and for disruptive politically motivated attacks. In 2011, in the wake of the Arab Spring, which spread across North Africa and the Middle East (including Yemen), Saleh's time in office became more and more untenable until eventually he was ousted as President in 2012. He was succeeded by Abdrabbuh Mansur Hadi. In May 2015, Saleh openly allied with the Houthis (Ansar Allah) during the Yemeni Civil War, in which a protest movement and subsequent insurgency succeeded in capturing Yemen's capital, Sana'a, causing President Abdrabbuh Mansur Hadi to resign and flee the country. In December 2017, he declared his withdrawal from his coalition with the Houthis and instead sided with his former enemies – Saudi Arabia, the United Arab Emirates and President Hadi. Accused of treason by the Houthis, he was killed by a Houthi sniper while attempting to flee the capital city of Sana'a amidst the 2017 battle for the city on 4 December 2017. Ali Abdullah Saleh (Arabic: علي عبدالله صالح‎) was born on 21 March 1947 to a poor family at Bait el-Ahmar village (Red House village) from the Sanhan (سنحان) clan (Sanhan District), whose territories lie some 20 kilometres southeast of the capital, Sana'a. Saleh's father, Abdallah Saleh died when Saleh was still young and after he divorced with Ali Abdullah's mother. His mother later remarried to her deceased former husband's brother, Muhammad Saleh, who soon became Saleh's mentor and stepfather. Saleh's cousin, Ali Mohsen al-Ahmar from the Al Ahmar family, which is also part of Sanhan clan is often confused with the same-named leading family of the Hashid tribe, with which the Sanhan clan was ally. The Hashid tribe, in turn, belongs to the larger Yemeni parent group, the Kahlan tribe. The clans Sanhan and Khawlan are said to be related. Saleh received his primary education at Ma'alama village before leaving to join the North Yemeni Armed Forces in 1958 at the age of 11 as an infantry soldier, and was admitted to the North Yemen Military Academy in 1960. Three years later, in 1963, he was commissioned as a second lieutenant in the Armoured Corps. He participated in the Nasserist-inspired Army Coup of 1962, which was instrumental in the removal of King Muhammad al-Badr and the establishment of the Yemen Arab Republic. During the North Yemen Civil War he served in the Tank Corps, attaining the rank of major by 1969. He received further training as a staff officer in the Higher Command and staff C Course in Iraq, between 1970 and 1971, and was promoted to lieutenant colonel. He became a full colonel in 1976 and was given command of a mechanised brigade. In 1977, the President of North Yemen, Ahmed bin Hussein al-Ghashmi, appointed him as military governor of Ta'izz. After al-Ghashmi was assassinated on 24 June 1978, Colonel Saleh was appointed to be a member of the four-man provisional presidency council and deputy to the general staff commander. On 17 July 1978, Saleh was elected by the Parliament to be the President of the Yemen Arab Republic, while simultaneously holding the positions of chief of staff and commander-in-chief of the armed forces. Governance in the Middle East and North Africa: A Handbook describes Saleh as being neither from a "sheikhly family" nor a "large or important tribe", but instead rising to power through "his own means", and creating a patronage system with his family at the top. His seven brothers were placed "in key positions", and later he relied on "sons, daughters, sons-in-law and nephews". Beneath the positions occupied by his extended family, Saleh "relied heavily on the loyalty" of two tribes, his own Sanhan tribe and the Hamdan San'a tribe of his mentor, the late president Ahmad al-Ghashmi. The New York Times Middle Eastern correspondent Robert F. Worth described Saleh as reaching an understanding with powerful feudal "big sheikhs" to become "part of a Mafia-style spoils system that substituted for governance". Worth accused Saleh of exceeding the aggrandisement of other Middle Eastern strongmen by managing to "rake off tens of billions of dollars in public funds for himself and his family" despite the extreme poverty of his country. On 10 August 1978, Saleh ordered the execution of 30 officers who were charged with being part of a conspiracy against his rule. Saleh was promoted to major general in 1980, elected as the secretary-general of the General People's Congress party on 30 August 1982, and re-elected president of the Yemen Arab Republic in 1983. In the late 1980s, Saleh was under considerable international pressure to permit his country's Jewish citizens to travel freely to places abroad. Passports were eventually issued to them, which facilitated their unrestricted travel. The decline of the Soviet Union severely weakened the status of South Yemen, and, in 1990, the North and South agreed to unify after years of negotiations. The South accepted Saleh as President of the unified country, while Ali Salim al-Beidh served as the Vice President and a member of the Presidential Council. Ali Abdullah Saleh was a long-time ally of Iraq's Saddam Hussein and supported Hussein's invasion of Kuwait in 1990. After Iraq lost the Gulf War, Yemeni workers were deported from Kuwait by the restored government. In the 1993 parliamentary election, the first held after unification, Saleh's General People's Congress won 122 of 301 seats. Around 1994, jihadists from Ayman al-Zawahiri’s Egyptian Islamic Jihad attempted to regroup in Yemen following a harsh crackdown in Egypt. In this, they were tacitly supported by the regime of Ali Abdullah Saleh, as he found them useful in his fight against southern separatists in the war of 1994. After using Islamic militants to repress the separatists and keep the country under his rule, Saleh turned a blind eye to their activities, and allowed their sympathizers to work in his intelligence services. On 24 December 1997, Parliament approved Saleh's promotion to the rank of field marshal, making him highest-ranking military officer in Yemen. He became Yemen's first directly-elected president in the 1999 presidential election, winning 96.2% of the vote. :310 The only other candidate, Najeeb Qahtan Al-Sha'abi, was the son of Qahtan Muhammad al-Shaabi, a former president of South Yemen. Though a member of Saleh's General People's Congress (GPC) party, Najeeb ran as an independent. After the 1999 elections the Parliament passed a law extending presidential terms from five to seven years, extending parliamentary terms from four to six years, and creating a 111-member, presidentially-appointed council of advisors with legislative power. This move prompted Freedom House to downgrade their rating of political freedom in Yemen from 5 to 6. In July 2005, during the 27th anniversary celebrations of his presidency, Saleh announced that he would "not contest the [presidential] elections" in September 2006. He expressed hope that "all political parties – including the opposition and the General People's Congress – find young leaders to compete in the elections, because we have to train ourselves in the practice of peaceful succession." However, in June 2006, Saleh changed his mind and accepted his party's nomination as the presidential candidate of the GPC, saying that when he initially decided not to contest the elections his aim was "to establish ground for a peaceful transfer of power", and that he was now, however, bowing to the "popular pressure and appeals of the Yemeni people." Political analyst Ali Saif Hasan said that he had been "sure [President Saleh] would run as a presidential candidate. His announcement in July 2005 – that he would not run – was exceptional and unusual." Mohammed al-Rubai, head of the opposition supreme council, said the president's decision "show[ed] that the president wasn't serious in his earlier decision. I wish he hadn't initially announced that he would step down. There was no need for such farce." In December 2005, Saleh stated in a nationally televised broadcast that only his personal intervention had preempted a U.S. occupation of the southern port of Aden after the 2000 USS Cole bombing, stating "By chance, I happened to be down there. If I hadn't been, Aden would have been occupied as there were eight U.S. warships at the entrance to the port." However, transcripts from the U.S. Senate Armed Services Committee state that no other warships were in the vicinity at the time. After 9/11, Saleh sided with America in the War on Terror. Following mysterious “escape” of Al Qaeda convicts in Yemeni custody; Saleh would demand more American money and support in order to catch the fugitive. Sometimes, having received what he needed, he would decide to pardon them, further infuriating the United States. Saleh knew he was an indispensable partner so the aid continued. In an investigative documentary allegations were made that Saleh’s government supported and directly helped Al Qaeda in the Arabian Peninsula (AQAP). An informant for the National Security Bureau (NSB) and Political Security Organization (PSO) made these allegations. Richard Barrett, who was with Britain’s MI6 intelligence agency before becoming director of the Al-Qaeda Monitoring Team for the UN, described Mujahid’s story of his background in Afghanistan, his return to Yemen and his involvement with AQAP as “credible”. The attack on the U.S. Embassy in 2008 was funded by Saleh’s nephew and Al Qaeda leaders had close relationships with him. The informant also gave critical intelligence on terrorist movement, attacks and leaders but no action was taken. In early 2011, following the Tunisian revolution which resulted in the overthrow of the long-time Tunisian president, Zine El Abidine Ben Ali, opposition parties attempted to do the same in Yemen. Opposition elements started leading protests and demanding that Saleh end his three-decade-long rule because of the perceived lack of democratic reform, widespread corruption and human rights abuses carried out by him and his allies. His net worth was estimated to be between 32 and 64 billion dollars with his money spread across multiple accounts in Europe and abroad. On 2 February 2011, facing a major national uprising, Saleh announced that he would not seek re-election in 2013, but would serve out the remainder of his term. In response to government violence against protesters, eleven MPs of Saleh's party resigned on 23 February. By 5 March, this number had increased to 13, as well as the addition of two deputy ministers. On 10 March 2011, Saleh announced a referendum on a new constitution, separating the executive and legislative powers. On 18 March, at least 52 people were killed and over 200 injured by government forces when unarmed demonstrators were fired upon in the university square in Sana'a. The president claimed that his security forces weren't at the location, and blamed local residents for the massacre. On 7 April 2011, a U.S. state department cable obtained by WikiLeaks reported the plans of Hamid al-Ahmar, the Islah Party leader, prominent businessman, and de facto leader of Yemen's largest tribal confederation, claiming that he would organize popular demonstrations throughout Yemen aimed at removing President Saleh from power. On 23 April 2011, facing massive nationwide protests, Saleh agreed to step down under a 30-day transition plan in which he would receive immunity from criminal prosecution. He stated that he planned to hand power over to his Vice President, Abdrabbuh Mansur Hadi as part of the deal. On 18 May 2011, he agreed to sign a deal with opposition groups, stipulating that he would resign within a month; On 23 May, Saleh refused to sign the agreement, leading to renewed protests and the withdrawal of the Gulf Cooperation Council from mediation efforts in Yemen. On 3 June 2011, Saleh was injured in a bomb attack on his presidential compound. Multiple C-4 (explosive) charges were planted inside the mosque and one exploded when the president and major members of his government were praying. The explosion killed four bodyguards and injured the prime minister, deputy prime ministers, head of the Parliament, governor of Sanaa and many more. The man responsible for speaking at Saleh's public events was reported killed. Saleh suffered burns and shrapnel injuries, but survived, a result that was confirmed by an audio message he sent to state media in which he condemned the attack, but his voice clearly revealed that he was having difficulty in speaking. Government officials tried to downplay the attack by saying he was lightly wounded. The next day he was taken to a military hospital in Saudi Arabia for treatment. According to U.S. government officials, Saleh suffered a collapsed lung and burns on about 40 percent of his body. A Saudi official said that Saleh had undergone two operations: one to remove the shrapnel and a neurosurgery on his neck. On 7 July 2011, Saleh appeared for his first live television appearance since his injury. He appeared badly burned and his arms were both bandaged. In his speech, he welcomed power-sharing but stressed it should be "within the framework of the constitution and in the framework of the law". On 19 September 2011, he was pictured without bandages, meeting King Abdullah. On 23 September 2011, Yemeni state-television announced that Saleh had returned to the country after three months amid increasing turmoil in a week that saw increased gun battles on the streets of Sana'a and more than 100 deaths. Saleh said on 8 October 2011, in comments broadcast on Yemeni state television, that he would step down "in the coming days". The opposition expressed skepticism, however, and a government minister said Saleh meant that he would leave power under the framework of a Gulf Cooperation Council initiative to transition toward democracy. On 23 November 2011, Saleh flew to Riyadh in neighbouring Saudi Arabia to sign the Gulf Co-operation Council plan for political transition, which he had previously spurned. Upon signing the document, he agreed to legally transfer the office and powers of the presidency to his deputy, Vice President Abdrabbuh Mansur Hadi. The agreement also led to the formation of a government divided by Saleh's political party (GPC) and the JMP. It was reported that Saleh had left Yemen on 22 January 2012 for medical treatment in New York City. He arrived in the United States six days later. After Saleh returned to Yemen following medical treatment, he arrived at the military airport in Sana'a hours before the oath-taking of his successor Abdrabbuh Mansur Hadi which resulted in protests against his return and the inability of the new government to prevent his entry into Yemen. On 27 February 2012, Saleh formally ceded power to his deputy Abdrabbuh Mansur Hadi and stepped down as the President of Yemen, pledging to support efforts to "rebuild" the country still reeling from months of violence. In February 2013, Saleh opened a museum documenting his 33 years in power, located in a wing of the Al-Saleh Mosque in Sanaa. One of the museum's central display cases exhibits a pair of burnt trousers that Saleh was wearing at the time of his assassination attempt in June 2011. Other displays include fragments of shrapnel that were taken out of his body during his hospital treatment in Saudi Arabia, as well as various gifts given to Saleh by kings, presidents and world leaders over the course of his rule. Later that year, in October, the United Nations Special Envoy to Yemen, Jamal Benomar said that Saleh and his son have the right to run in the next Yemeni presidential election, as the 2011 deal does not cover political incapacitation. Saleh was a behind-the-scenes leader of the Houthi takeover in Yemen led by Zaydi Houthi forces. Tribesmen and government forces loyal to Saleh joined the Houthis in their march to power. On 28 July 2016, Saleh and the Houthi rebels announced a formal alliance to fight the Saudi-led military coalition, run by a Supreme Political Council of 10 members – made up of five members from Saleh's General People's Congress, and five from the Houthis. The members were sworn in on 14 August 2016. The United Nations Security Council imposed sanctions on Saleh in 2014, accusing him of threatening peace and obstructing Yemen's political process, subjecting him to a global travel ban and an asset freeze. Houthi spokesperson Mohamed Abdel Salam stated that his group had spotted messages between the United Arab Emirates (UAE) and Saleh three months before his death. He told Al-Jazeera that there was communication between Saleh, UAE and a number of other countries such as Russia and Jordan through encrypted messages. The alliance between Saleh and the Houthi broke down in late 2017, with armed clashes occurring in Sana'a from 28 November. Saleh declared the split in a televised statement on 2 December, calling on his supporters to take back the country and expressed openness to a dialogue with the Saudi-led coalition. On 4 December 2017, Saleh's house in Sana'a was assaulted by fighters of the Houthi movement, according to residents. Saleh was killed on his way to Ma'rib while trying to flee into Saudi-controlled territories after a rocket-propelled grenade struck and disabled his vehicle in an ambush and he was subsequently shot in the head by a Houthi sniper, something his party denied. 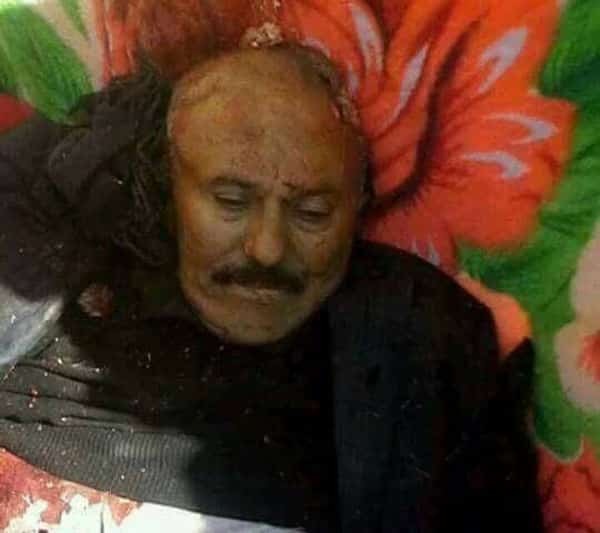 Houthis published a video allegedly depicting Saleh's body with a headshot wound. His death was confirmed by a senior aide to Saleh, and also by Saleh's nephew. His death has been described as an embarrassment in a long list of Saudi foreign policy failures under Mohammad bin Salman. The attack also resulted in the death of General People's Congress' assistant secretary Yasser al-Awadi. Saleh's home was captured by Houthis before he fled. Officials of his party General People's Congress while confirming his death, stated that a convoy he and other party officials were travelling in was attacked by Houthis as they fled towards his hometown Sanhan. Houthi leader Abdul Malik al-Houthi meanwhile celebrated his death and called it "the day of the fall of the treasonous conspiracy". He also stated that his group had "no problem" with the GPC or its members. Abdrabbuh Mansur Hadi offered condolences for his death and called for an uprising against the Houthis. The Houthis accused the UAE of dragging Saleh to "this humiliating fate." On 9 December 2017 he was buried in Sana'a, according to an official. According to a Houthi commander, the burial was held in strict conditions with no more than 20 people attending. The UN Sanctions Panel said that, by 2012 Saleh had amassed a fortune worth $32–60 billion hidden in at least twenty countries, making him one of the richest people in the world. Saleh was gaining $2 billion a year from 1978 to 2012, mainly through illegal methods, such as embezzlement, extortion and theft of funds from Yemen's fuel subsidy program. W. Day, Stephen (2012). Regionalism and Rebellion in Yemen: A Troubled National Union. Cambridge University Press. ISBN 978-1-1070-2215-7. ^ There is a dispute as to Saleh's date of birth, some saying that it was on 21 March 1942. See: Downing, Terry Reese (1 November 2009). "Martyrs in Paradise". AuthorHouse. Retrieved 4 December 2017 – via Google Books. . However, by Saleh's own confession, he was born in 1947. ^ "هذا ما عثر عليه مع علي عبد الله صالح". Retrieved 18 October 2018. ^ Encyclopedia of World Biography. Thomson Gale. 2006. Retrieved 7 April 2011. ^ Riedel, Bruce (2017-12-18). "Who are the Houthis, and why are we at war with them?". Brookings. Retrieved 2018-06-12. ^ a b "AFP: Yemen's Saleh formally steps down after 33 years". Google. Retrieved 3 March 2012. ^ Spencer, Richard (2011-06-11). "Yemen defector says terror crisis was manufactured to win western support". ISSN 0307-1235. Retrieved 2019-02-25. ^ "Informant claims former Yemen leader's regime worked with Al-Qaeda". america.aljazeera.com. Retrieved 2019-02-25. ^ "Yemen's Saleh declares alliance with Houthis". Al Jazeera. Retrieved 27 May 2015. ^ "Yemen: Ex-President Ali Abdullah Saleh killed". Al Jazeera. Retrieved 4 December 2017. ^ "Houthis claim takeover of Yemeni capital, president calls for 'all people' to rise against them". RT International. Retrieved 4 December 2017. ^ Sputnik. "What Does the Death of Former President Saleh Mean for the Yemeni Civil War?". sputniknews.com. Retrieved 5 December 2017. ^ Browning, Noah. "The last hours of Yemen's Saleh". Retrieved 18 October 2018. ^ "Analysis: Yemen's ex-president Saleh's killing was 'revenge'". Al Jazeera. Retrieved 4 December 2017. ^ Hakim Almasmari, Tamara Qiblawi and Hilary Clarke. "Yemen's former President Saleh killed in Sanaa". CNN. Retrieved 4 December 2017. ^ a b c "الرئيس اليمني علي عبد الله صالح" (in Arabic). Al Jazeera. 23 June 2006. ^ a b c d e f g h "YEMEN – Ali Abdullah Saleh Al-Ahmar". APS Review Downstream Trends. 26 June 2006. Retrieved 7 April 2011. ^ "علي عبدالله صالح.. في صور" (in Arabic). Al Arabiya. 4 December 2017. ^ a b Day 2012, p. 88. ^ a b c d e f g h "President Ali Abdullah Saleh Web Site". Presidentsaleh.gov.ye. Archived from the original on 19 December 2010. Retrieved 18 November 2010. ^ a b c K. Kadhim, Abbas (2013). Governance in the Middle East and North Africa: A Handbook. Routledge. p. 309. Retrieved 2 August 2016. ^ Worth, Robert F. (2016). A Rage for Order: The Middle East in Turmoil, from Tahrir Square to ISIS. Pan Macmillan. p. 105. Retrieved 31 July 2016. ^ Worth, Robert F. (2016). A Rage for Order: The Middle East in Turmoil, from Tahrir Square to ISIS. Pan Macmillan. p. 98. Retrieved 31 July 2016. ^ Burrowes, Robert D. (1987). The Yemen Arab Republic: The Politics of Development, 1962–1986. Westview Press. ISBN 978-0-8133-0435-9. ^ a b c d e "Yemen's ex-president Saleh shot dead after switching sides in civil war". Reuters. 4 December 2017. Retrieved 4 December 2017. ^ Evans, Judith (10 October 2009). "Gulf aid may not be enough to bring Yemen back from the brink". The Sunday Times. London. Archived from the original on 29 April 2011. Retrieved 7 April 2011. ^ a b Nohlen, Dieter; Grotz, Florian; Hartmann, Christof, eds. (2001). Elections in Asia: A data handbook, Volume I. Oxford: Oxford University Press. pp. 309–310. ISBN 978-0-19-924958-9. Retrieved 7 April 2011. ^ "The last refuge: Yemen, al-Qaeda, and America's war in Arabia". Choice Reviews Online. 50 (10): 50–5773-50-5773. 2013-05-22. doi:10.5860/choice.50-5773. ISSN 0009-4978. ^ a b Soufan, Ali (2017-12-05). "'I Will Die in Yemen'". The Atlantic. Retrieved 2019-02-25. ^ a b "In eleventh-hour reversal, President Saleh announces candidacy". IRIN. 25 June 2006. Retrieved 14 December 2010. ^ "Freedom in the World – Yemen (2002)". Freedom House. 2002. Archived from the original on 21 March 2011. Retrieved 7 April 2011. ^ "Yemen leader rules himself out of polls". Al Jazeera. 17 July 2005. Retrieved 14 December 2010. ^ "Yemeni president takes constitutional oath for his new term". Xinhua News Agency. 27 September 2006. Retrieved 14 December 2010. ^ "US mulled occupying Aden after Cole bombing: Yemen". Khaleej Times. 1 December 2005. Archived from the original on 29 September 2012. Retrieved 14 December 2010. ^ a b c d e f "Yemen's former President Ali Abdullah Saleh killed trying to flee Sanaa". CNN. 4 December 2017. Retrieved 4 December 2017. ^ "Is Yemen's Saleh really worth $64 billion?". Retrieved 18 October 2018. ^ Almasmari, Hakim (2 February 2011). "Yemeni President won't Run Again". The Wall Street Journal. Archived from the original on 4 February 2011. Retrieved 2 February 2011. ^ Yemen protest: Ruling party MPs resign over violence, BBC News, 23 February 2011. ^ Yemen MPs quit ruling party, Al Jazeera, 3 March 2011. ^ Wikileaks, The Washington Post, 7 April 2011. ^ Birnbaum, Michael (23 April 2011). "Yemen's President Saleh agrees to step down in return for immunity". The Washington Post. Retrieved 23 April 2011. ^ "Yemeni President Saleh signs deal on ceding power". BBC News. 23 November 2011. Retrieved 20 January 2017. ^ "YEMEN: Deal outlined for President Ali Abdullah Saleh to leave within a month". Los Angeles Times. ^ "Sky News, 23 May 2011". Retrieved 4 December 2017. ^ a b c "Wounded Yemeni president in Saudi Arabia". Al Jazeera. 5 June 2011. Retrieved 23 November 2011. ^ "Sources: Yemeni head Saleh has collapsed lung, burns over 40% of body". CNN. 7 June 2011. ^ "Yemeni president flees nation for medical treatment". Archived from the original on 22 February 2014. Retrieved 7 April 2015. ^ "Al-Hadi acting President of Yemen". Blogs.aljazeera.net. 4 June 2011. Retrieved 3 December 2011. ^ "Yemen President Ali Abdullah Saleh appears on TV". BBC News. 7 July 2011. ^ "Yemeni Protests Continue after Saleh Signs Deal". Retrieved 18 October 2018. ^ "Yemen's Saleh calls for ceasefire on return". Al Jazeera. 23 September 2011. Retrieved 23 November 2011. ^ "Yemen president 'to step down'". Al Jazeera. 8 October 2011. Retrieved 8 October 2011. ^ Finn, Tom (23 November 2011). "Yemen president quits after deal in Saudi Arabia". The Guardian. Retrieved 2 December 2011. ^ Laura Kasinof (22 January 2012). "Yemen Leader Leaves for Medical Care in New York". The New York Times. Retrieved 22 January 2012. ^ "Official: Yemen president in US for treatment". The Wall Street Journal. 28 January 2012. Archived from the original on 12 October 2017. Retrieved 28 January 2012. ^ "Yemen's Saleh opens museum – about himself". Reuters. Archived from the original on 19 February 2013. Retrieved 18 February 2013. ^ Saleh has right to run for president Archived 19 February 2014 at the Wayback Machine, moslempress.com. Retrieved 7 April 2015. ^ Peter Salisbury. "Yemen's former president Ali Abdullah Saleh behind Houthis' rise". Financial Times. Retrieved 26 March 2015. ^ "Yemen's Houthi rebels announce alliance with ousted president". Fox News Channel. 28 July 2016. Retrieved 2 August 2016. ^ "Saba Net - Yemen news agency". ^ al-Sayaghi, Mohamed (14 October 2017). "Yemen's ex-president Saleh stable after Russian medics operate". Reuters. Retrieved 15 October 2017. ^ "الحوثيون: رصدنا رسائل بين صالح وأبوظبي قبل 3 شهور" (in Arabic). Al Khaleej. 4 December 2017. Retrieved 5 December 2017. ^ a b Edroos, Faisal (4 December 2017). "How did Yemen's Houthi-Saleh alliance collapse?". Al Jazeera. Retrieved 4 December 2017. ^ Leith Fadel (2 December 2017). "Violence escalates in Sanaa as Saleh loyalists battle Houthis". Al Masdar News. Retrieved 2 December 2017. ^ "Yemen's Houthis blow up ex-president Saleh's house". Reuters. 4 December 2017. Retrieved 4 December 2017. ^ "Yemen ex-President Saleh killed by Houthis – reports". RT International. 4 December 2017. Retrieved 4 December 2017. ^ "Houthis reportedly gain control of majority of Sanaa". Al Jazeera. 4 December 2017. ^ "الحوثيون ينشرون صورا وفيديو لمقتل على عبد الله صالح". Youm7. Retrieved 4 December 2017. ^ "Ali Abdullah Saleh's death will shake up the war in Yemen". The Economist. Retrieved 5 December 2017. ^ "Yemen: Ex-President Ali Abdullah Saleh killed". Al Jazeera. ^ "Ali Abdullah Saleh, Yemen's former leader, killed in Sanaa". BBC. ^ "ناطق أنصار الله: الإمارات أوصلت زعيم ميليشيا الخيانة إلى هذه النهاية المخزية ولا مشكلة مع المؤتمر". المسیرة (in Arabic). ^ "Yemen's slain ex-President Saleh buried". Business Standard. 9 December 2017. ^ "Yemen rebels bury Saleh in closed funeral: family source". Business Standard. 9 December 2017. ^ a b c "President Ali Abdullah Saleh of Yemen is invested into the Order of Francesco I. Duke of Calabria receives highest Yemeni decoration on behalf of the Constantinian Order – Sacred Military Constantinian Order of St. George". 27 March 2004. Retrieved 4 December 2017. ^ "Yemen's Saleh Worth $60 Billion Says UN Sanctions Panel - UN Tribune". 24 February 2015. Retrieved 18 October 2018. ^ "Yemen ex-leader 'amassed billions'". 25 February 2015. Retrieved 18 October 2018 – via www.bbc.com. ^ Sahajwani, Manish (9 September 2012). "7 of the Richest Dictators In History". Retrieved 18 October 2018. 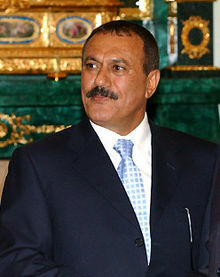 Wikimedia Commons has media related to Ali Abdullah Saleh. "Ali Abdullah Saleh collected news and commentary". The New York Times.